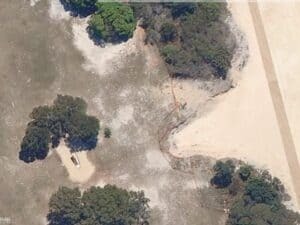 What’s Happening at Benny Street, Bribie Island? The Benny Street stormwater outlets are in the news these days. 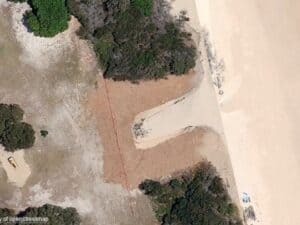 Some 18 months ago the decision was made to clear and excavate about 80 metres of dune area around the outlets, but since then nothing has happened. The area has been flagged off and further work has been halted even though the area is actively eroding and parts of the Boyd Street Erosion Control Area are collapsing into the eroded areas. Writers to Letters-to-the-Editor are blaming local residents for this inaction. Local Council officials, of course, are blaming someone else – this time the State Government for not issuing the necessary approvals for this work on State-owned lands. And the State Government naturally says the delay has nothing to do with them. State Government officers advise that although this work has been on-going for over 18 months, they have only recently been contacted on the matter. So what is happening? 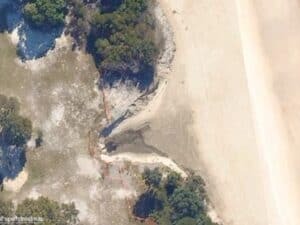 In this week’s story, MyBribieIsland tries to determine what has happened to date, why it has happened, what is planned for the future, and what should be planned. Outlets from beach showing how far the erosion has penetrated into the dunes and beyond into the Boyd Street Erosion Control Area. Sandbags have been piled up against the dune to the north (right of picture) though the worst erosion is probably to the south. View of outlets, February 16 2012. (Above) Outlets from beach showing how far the erosion has penetrated into the dunes and beyond into the Boyd Street Erosion Control Area. Sandbags have been piled up against the dune to the north (right of picture) though the worst erosion is probably to the south. (Below left) Pipes in the erosion control area waiting to be installed. They were recently moved back as a result of the ongoing erosion. (Below right) View of ongoing erosion showing the remaining pipes being undermined and collapsing. This situation has been developing now for over 18 months. Pipes in the erosion control area waiting to be installed. They were recently moved back as a result of the ongoing erosion. View of ongoing erosion showing the remaining pipes being undermined and collapsing. This situation has been developing now for over 18 months. So what do these outlets do and who is responsible for them? The Benny Street storm-water outlets are part of the decades-old underground systems that collect and discharge storm water collected in the Woorim area. These pipes discharge storm water only. All discharges of domestic waste go to the Woorim sewerage treatment plant on First Avenue behind the sporting fields. The Benny Street storm water pipes are owned and maintained by MBRC but they cross coastal land and dunal systems before discharging. 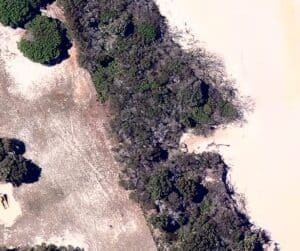 In Queensland, all coastal lands (including beaches and the dune systems behind them) are owned by the State Government but they are held in trust by the local councils. Any activity undertaken by a council on State-owned lands must comply with all legislation associated with those coastal lands such as the Coastal Management Act, the Conservation of Migratory Species Act, the Sustainable Management Act and the Aboriginal Cultural Heritage Act. Any major work in those areas (such as work on the storm water pipe discharge) needs State Government approval prior to commencement. What changed after November 2009 and why. In 2006, in response to major concerns raised by local residents following some significant erosion events during that storm season, Caboolture Shire Council (CSC) commissioned the highly respected international consultants BMT WBM to undertake a study of the causes of the erosion in the Woorim area and to outline a programme to address those causes. Their report is known as the Woorim Beach Shorline Erosion Management Plan (WBSEMP). 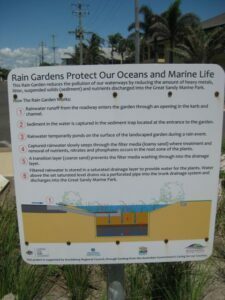 It was endorsed with no changes or variations by Council in November 2007 and can be found on MBRC’s web site at: http://www.moretonbay.qld.gov.au/general.aspx?id=64971&terms=woorim+beach+shoreline+erosion+management+plan. One of the major WBSEMP recommendations called for CSC (now part of MBRC) to undertake a sand replenishment programme along the Woorim foreshore to replace sand that had been eroded away. The WBSEMP called for an initial placement of 300,000 cubic metres of sand. The WBSEMP noted that approximately 30,000 cubic metres of sand are eroded from the Woorim coastline each year and the WBSEMP recommended that this amount be replaced each year as an absolute minimum. The WBSEMP made a strong recommendation that this sand be added evenly over the affected area and to avoid placing too much sand in one area to prevent formation of a groyne(s). Unfortunately, this recommendation was not followed and a major portion of the sand was placed immediately in the recreational beach area at Woorim. The WBSEMP predicted that if a groyne were established in this area, then 50 – 80 metres of dune area would be lost on the downstream side as a result of the disruption to the long-shore currents. This prediction has proved to be quite accurate with at least 50 metres of dune being eroded and lost during the 2010 storm season. Prior to this erosion, the Benny Street pipes discharged into Freshwater Creek and from there the storm water made its way to the ocean. Following the 2010 erosion period, the Benny Street pipes were exposed and discharged directly onto the Woorim beach area. 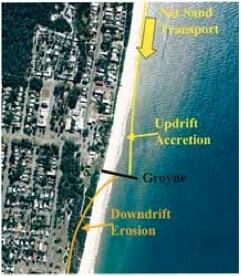 Fig 4-4 from WBSEMP showing the erosion that would occur downstream of any groyne. The WBSEMP predicted that more than 50 metres on dune would be eroded if too much sand were placed in one place and a groyne resulted. Woorim beach looking north from Boyd Street Car Park in early 2010. Note the groyne that has been established at the Woorim township area. Over 50 metres of dune was lost in the Benny Street area after this groyne was established. What has been done as a result of the 2010 erosion? 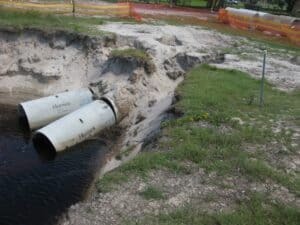 In October 2010, for whatever reason, local Council officials declared that an “emergency” existed at the Benny Street outlets and undertook significant clearing and removal of the dune and the dune vegetation to allow the pipes to be excavated and exposed as shown in the photos below. This work was undertaken without consultation with the relevant State Government authorities and it established a new discharge point further back into the Boyd Street Erosion Control Area. This work destabilized that area and as a consequence it is most prone to erosion. 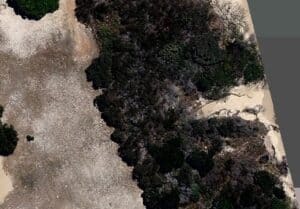 The erosion effects are shown in the photos below in a series of satellite photos from NearMap. Outlets in January 2010. Note that the Freshwater Creek exit has now been eroded away and the Benny Street pipes are discharging direct to the beach area. Outlets in November 2010 showing the removal of the pipes. Large amount of vegetation has been removed and the pipes excavated and the discharge point has been moved back into the Boyd Street Erosion Control Area. April 2011 The area has now become a major eyesore, and the dunes to the north and south of the opening are being actively eroded as they are now destabilized as a result of the removal of the vegetation and pipes. May 2011. Area has continued to erode. 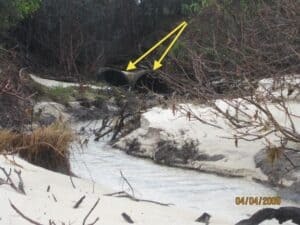 During the dune building season of 2011, Freshwater Creek has re-established a drainage channel in front of the Benny Street stormwater discharge. 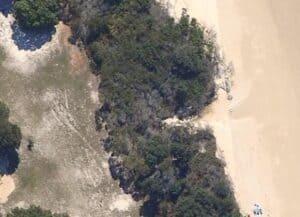 Freshwater Creek has been directed away from the Benny Street area and erosion continues to remove the dunes to the north and south of the Benny Street exits but no action has been taken to resolve this situation. If it was just a question of putting the pipes back the way they were, then MBRC could probably proceed with that work immediately. No approvals would be required from the State Government. However, that status-quo solution would be unlikely to be successful as it would probably sand up. In would also fail to meet the best-in-class standards that Council agreed to in November 2011 when it adopted a motion put forward by the Division 1 Councilor. However from a hydraulic point of view, this modified proposal is essentially the same as the original installation. If it is not best-in-class, why is it being installed at such enormous cost to the ratepayers? Will this solution succeed? Will it sand up as well? Is this the correct solution to pursue? The simple answer to the question of what should be done is that MBRC should follow the guidelines that won it the Excellence in Strategic Planning Award at the recent 2011 Stormwater Industry Association of Queensland Awards. This requires that best-in-class guidelines be followed for the engineering, and that affected residents be consulted as outlined in MBRC’s Thinkoutloud guidelines. The Benny Street project has been ongoing now for over 18 months and there has been ample opportunity follow both these guidelines but neither has occurred. The engineering solution being proposed has its risks. 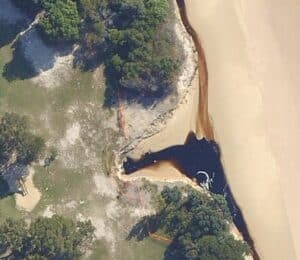 From an engineering point of view, any solution that has storm water discharging below Highest Astronomical Tide (HAT) runs the chance of sanding up, especially when discharging into the foredune area where sand accumulates in the winter dune-building period. Unfortunately there is insufficient fall available in the Benny Street system to allow the outlet to be lifted above HAT and the proposed solution will exit well below HAT and hence it has a high chance of sanding. 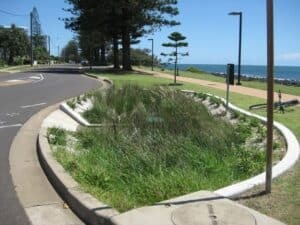 One low-risk alternative option would be to install a “raingarden” system such as the one shown below that was installed at Bundaberg. Similar installations have also been installed elsewhere in MBRC. The volumes of water involved at Benny Street might require some form of wetlands area to be created to make this work. However local Council officials have made it clear that no such alternative solutions will be considered. It would be of interest to determine what impact all this activity might have had on property values in that area.